Fusion-welded frame and sash profiles. Vinyl profiles won’t fade or discolor with age, and wipe clean with a damp cloth. 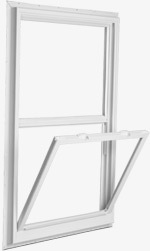 Frame profiles feature multiple chambers for increased strength and insulating properties. to MPG Plus™™ or MPG Extreme™™ packages. Available in White, Beige, Clay, Bronze or Hunter Green vinyl, as well as custom exterior colors. Choose from several standard grid patterns as well as custom pattern designs. All grids are located inside the insulating glass unit to provide a smooth cleaning surface and eliminate dirt build-up at the grid corners. Choose from several decorative glass options, including obscure and tinted glass.